Aquila is a late-summer constellation featuring an Eagle, although the asterism isn't particularly aquiline. Altair, alpha Aquilae, is one of the signposts in this region of the skies, forming what is known as The Summer Triangle with Vega and Deneb. The constellation has several binaries and a fine star cluster suited for larger binoculars. Alpha Aquilae, �Altair�, is the twelfth brightest star. It's name comes from the Arabic for Flying Eagle. 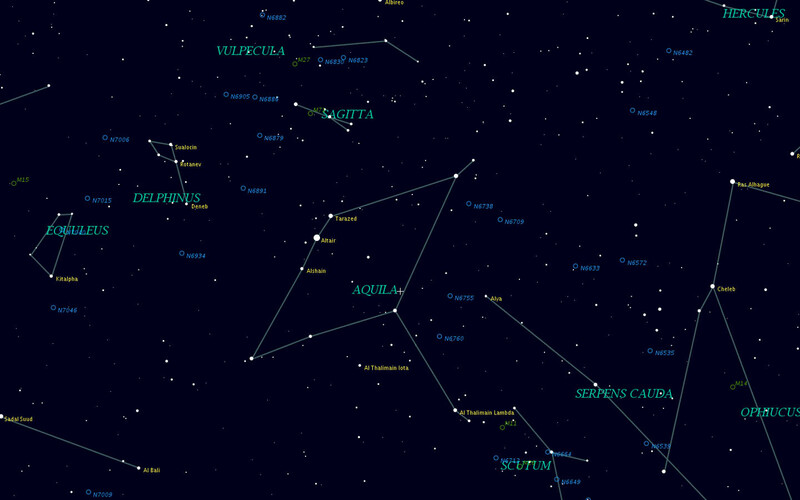 The constellation is high in the mid-summer skies, between Sagittarius and Capricornus. Altair is the southern tip of the Summer Triangle, the most noticeable asterism in the summer skies. She is attended by gamma Aquilae (north) and beta Aquilae (south). Eta Aquilae is an interesting Cepheid variable, easily studied with binoculars. The range of variation is from 3.7 to 4.5, and by comparing with beta (3.7, to the north in the same FOV) one can gauge eta's magnitude. Experienced observers can even notice the variations with the naked eye. The star is due south of Altair just over one binocular FOV. Lambda Aquilae forms the southwestern tip of the asterism, three binocular fields southwest of Altair. The elegantly curving line is unmistakeable. In the same field is 15 Aquilae, a yellow giant with deep red optical companion (5.4, 7.0) resolved in small telescopes or even large binoculars, PA 209� and separation 38.4". Also in this field is the splendid Wild Duck Cluster (M11), just southeast of beta Scuti, best seen in medium to large telescopes. Zeta Aquilae marks the tip of the eagle's wing (or its tail in some renditions). The star is three binocular fields to the northwest of alpha. NGC 6709 is to the south-southwest, at the very edge of the viewing area. This is a loose star cluster of around 40 stars with the brightest being 9th-magnitude. To the south of zeta -- about one binocular field -- is R Aquilae, a long-period variable with a period of about 284 days, with a range of about 5.5 to 12.